Have you ever noticed that when Apple has a new product, lines of people start to form before the stores even opens? Have you ever waded through the crowds in Nordstrom’s shoe department on a Saturday? Or, ladies, have you tried to get a last-minute appointment for a color and cut? Its almost impossible. Yet, these are typically expensive purchases, women will wait in lines for, schedule appointments weeks in advance, and are willing to pay exorbitant fees for these products and services. Now, go look outside the window to your business. Are people lining up to talk with you? Are they calling you to get an appointment only to find they must wait three weeks out? No? Well, they certainly could be. The Allianz Women, Money and Power Study, 2006, found that nearly three of four women lack some type of outside assistance with their financial strategies. Look around you. Count four women and know that three of them could probably benefit from your products and services. Why aren’t women lining up to meet with you? It’s evident that so many of them need your products or services. Here’s the reason why – they don’t trust you or the industry you represent. “It doesn't matter whether it is purchases of cars, cosmetics, or even products for men, female consumption power is the leading consumption power in the world,” states Andrea Jung, President and CEO of Grameen America, a non-profit organization helping women in poverty build small businesses to create better lives for their families. During a Purse Strings presentation, a man interrupted and had this question. He said, “Why won’t women buy long term care insurance. Is it because it’s too expensive?” Look around and see that women will spend whatever it takes on items and services they feel are a value to them. Many women spend money on expensive, shoes, bags, travel, tennis, clothing, spa services and so on. When they see a value or have built a relationship with a brand that serves them, cost is irrelevant. This confirms there’s just one viable option for growing your business in the 21st century... create products and services that appeal to women clients. This takes creativity, planning, and hard work, but the rewards will make it worth your effort. What are you doing to build trusted relationships with your female customers and clients? Bridget Brennan, CEO of the consulting and training firm Female Factor and author of Why She Buys, has been studying women’s impact on the consumer marketplace for over ten years. Recently writing on Forbes.com, she presented strategies for attracting women to your business. Here’s a quick overview. • Make your products/services easier for women to buy. • Create services that supplement the products you offer to women consumers. • Don’t overplay female stereotypes in your marketing. • Women shop with all their senses. Find ways to engage them in your advertising. • Enable women to feel smarter just by doing business with you. Women can be a college graduate, successful professional, widow, or, all the above. Women today are choosing to wait longer to have children, may decided to stay single, or be in a partnered relationship with a man or a woman. If she is a mother, the age of her children plays into her financial needs. Is she divorced or widowed? An entrepreneur or stay-at-home mom? She could be a single-mother who is struggling financially or a single-mother who is professional with wealth. All the data demonstrates the importance of building relationships with your female customers. This could be assessing every touchpoint you have with your female customers, researching products or service that would serve your female customer base, or finding ways to gather information from your female customers to see how you might better serve them. • Are interested in her unique family situation, caregiving demands, career, money goals and risk tolerance – not just her assets. • Communicates clearly and on a timely basis. • Understand how women take in information through emotion, connection, intuition and other senses and use this information to make decisions. All the data demonstrates the importance of building relationships with your female customers. If you want women consumers lining up at your door then, learn how to serve the most powerful market! 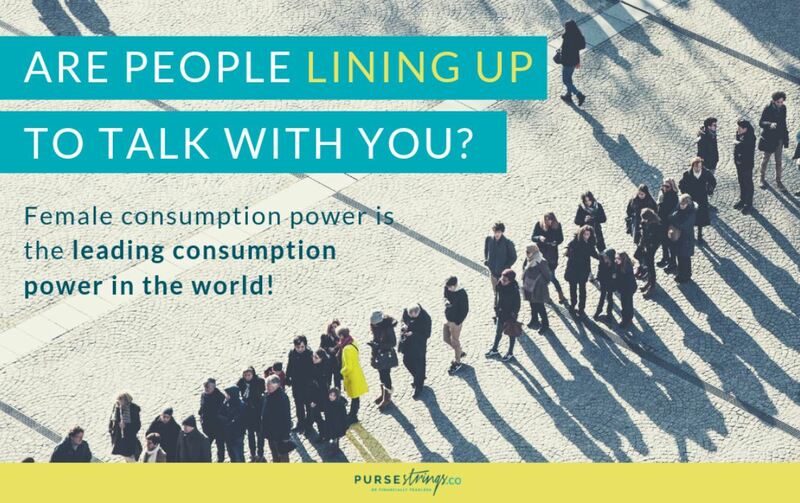 Purse Strings is here to help. 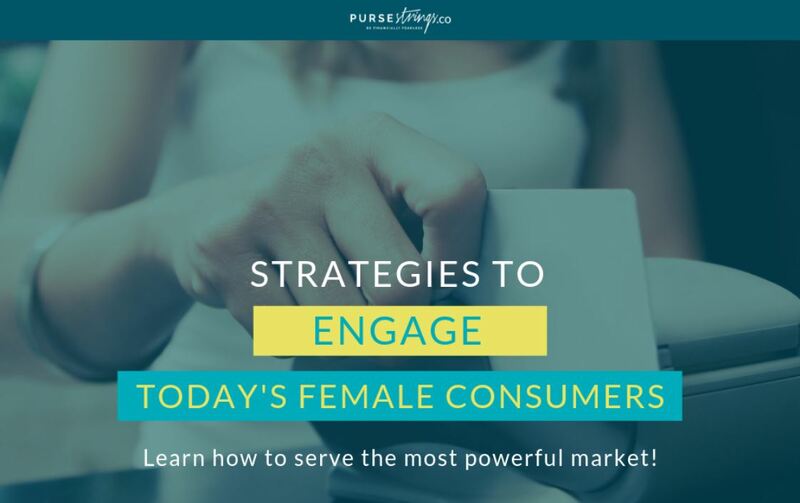 Go to www.pursestrings.co to register for our upcoming session on how to reach, engage and earn the female dollar. You can also earn 12 CE credits for agents in Illinois and all reciprocal states.